Labradoodle Training, are Australian Labradoodles good with Kids? Are labradoodles good with kids? Most Australian Labradoodles and Labradoodles are great with kids. That said there is much work to be done. One, you need to select the right Australian Labradoodle or Labradoodle that will be great with a child . Second, you need to assess your situation specifically. And third, we need to prepare, prepare your kids for an introduction to an Australian Labradoodle puppy plus prepare the puppy for your kids. We specifically select our Australian Labradoodle puppies for each family based on two elements, one the family profile sent to you during the adoption process and two, puppy temperament testing, preformed with each puppy many times while they are in our care. Combining these elements to select the right dog is critical. Not all Australian Labradoodles and/or Labradoodles are good with kids and easy to train. The higher drive of some dogs is not a good match. High drive in some dogs results in jumping up and more crazy movements resulting from the constant movement of children. The size of the dog or puppy will not matter; however, the amount of drive will have a huge impact on your child and your family. Breeds "purebreds" are bred for their drive which then results in the dog able to do the "work" of the breed. For example breeders of the German Shepard are looking for a specific drive in the breeding parents to enable the puppies to be successful guard dogs. Yes, some purebred breeders have gotten on a tangent and breed for conformation and successful show careers over the work of the dog; this is another article all together. Regardless most dogs in a breed (any breed) are genetically predisposed to the work of the breed. This results in some breeds better suited as the family companion. In my opinion the "work" of the Australian Labradoodle and Labradoodle is of family companion and guide dog. This requires a very laid back temperament, the ability to focus and pay attention to multiple family members at a young age. We are proud of our Muffin (Kiwi's full sister) who with the training of Dino Brownson is the youngest dog to ever pass the guide dog training test, at an unprecedented 7 months of age. So if now you have selected a Labradoodle or Australian Labradoodle for your family companion, which generation is the best fit? Many first generation Labradoodles (the initial mating of a Lab to a Poodle, F1) retain the higher drive of the Labrador retriever. This high drive lasts for about 2 years. There is a reason Labrador Retrievers don’t even begin training for guide dog or therapy work until the age of 2. They typically have a difficult time controlling themselves and gaining focus until this age. This does not mean you cannot introduce a First Generation Labradoodle to a family with kids, but it does mean that this match is more appropriate for the very active family going on long daily runs and older kids who can walk an active dog. This introduction will take more time on your part and the part of the kids for the first few years. Each new experience and change in the home environment and schedule will result in excitement for a dog. Dogs with a higher drive temperament will have a more difficult time controlling their behavior during these experiences. This can result in chaos; or a good hunting dog. 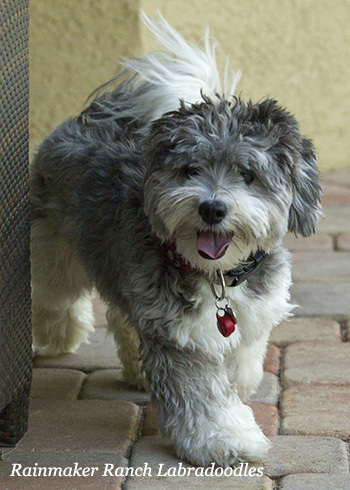 It is critical to know your breeder and the dogs expected temperament during the first year. If your breeder is not fully confident that their dogs will be fantastic with children during the first year or two move on to the other generations of Labradoodles or Australian Labradoodles. Some second generation Labradoodles have what it takes to integrate easily into a family of children. 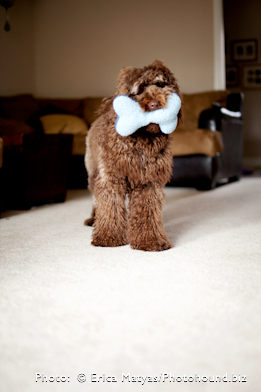 The addition of the standard poodle temperament twice resulting in a second generation Labradoodle (First generation, F1, breed to a poodle or f1B) may aid in the ability to focus at a young age. However, the breeding of any two dogs with poor temperaments themselves is a breeding practice to avoid, please run from these breeders. It shocks me the dogs some breeders will breed, those that have shown any type of aggression with other dogs or humans, those that you would not put with a toddler should not be bred, period. I would not recommend breeding with a toy poodle (due to their general high anxiety) or any parent of poor temperament and I strongly suggest you visit any breeder you are interested and meet the parents if possible, or call the vet of record and just ask, “What are the dogs like, please describe their temperaments?”, “Would you place the parent dog with a family of toddlers or kids?”. Stick to a breeder on a recommended breeder list, since you can be assured if a complaint was filed and proven truthful the breeder would not be listed. And above all know if your breeder breeds inside with close contact and a true understanding of the behavioral impact environment has on the dogs they produce. We follow the Super dogs process, http://www.britfeld.com/superdogs/superdogs.htm. 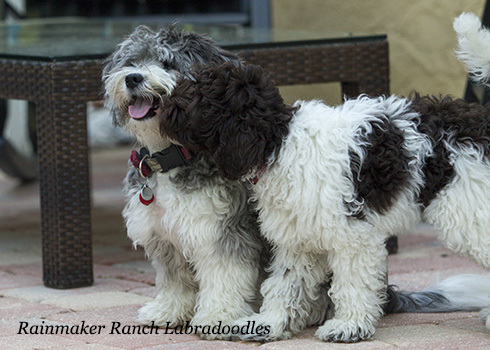 Australian Labradoodles (Poodle/Lab/Spaniel) and third generation Labradoodle (F1B to F1B) dogs typically have exactly what it takes to integrate easily into a family of young children or graduate as a guide dog. Multigen Australian Labradoodles are dogs of Poodle, Labrador Retriever and Spaniel (English Cocker or American Cocker) Heritage. Furthermore they are the result of multiple mating's of these dogs with health, temperament and conformation including coat in mind. i.e. the parents and grandparents are also Australian Labradoodles. The same rules I describe above for second generation Labradoodles apply to Multigen's. Select an Australian labradoodle or labradoodle breeder with top temperament breeding dogs. This is critical in producing a puppy that also has a great temperament and incredible with kids. Also select a breeder that understands the behavioral impact environment has on the puppies they produce. Puppies will mirror their families, if the situation is out of control the puppy will follow along. You need to look at your kids and your life. Will the kids follow your directions on how to interact with the puppy during play time? Will they have control of their little bodies and not run and scream when the puppy is around? Can they wait while you take the puppy outside to go to the bathroom? If you answered yes, then look at your own life. Can you follow a schedule that will involve at least 3 hours in addition to your day, plus remain outside supervising the puppy with the kids? Some of this time is just personal time with the puppy focused on training or petting the puppy (puppy love time), but it also includes having the puppy follow you around the house, cleaning up an accident and taking the puppy outside. All that adds up to time, do you have it? And will you have it for at least 2 to 4 months? If you just give up and confine the puppy, you will have a puppy that is not trained, unhappy and now out of control vying for your attention, negative or positive. We do offer additionally trained puppies to families needing extra help. This involves our trainer working with the puppy in her home for 3 to 4 weeks, from the age of 8 weeks to about 12 weeks. However, this does not mean the puppy will behave day one like an adult dog. It will be a trained puppy What this means is the puppy will know what to do outside, and not go to the bathroom inside, how to walk on a leash, not jump up, not nip and sleep in his crate all night. But without you spending the time to continue this training, especially the first two weeks home, this training will all be worthless. Puppies are like kids, in a new situation they test the rules and the boundaries. For the sake of the child's safety and for the sake of a trusting relationship between child and dog and let’s face it your sanity, you want your dog to learn "child equals good" so it is important to create pleasant associations. This is done by actively coaching the child, teaching the dog to have a positive association with the child and monitoring the dogs stress and the child’s responses. Purchase the books, Raising Puppies and Kids Together, a Guide for parents. Pia Silvani, CPDT and Lynn Eckhardt and Happy Kids, Happy Dogs Building a Friendship Right from the Start, Barbara Shumannfang. If you are on our wait list, the first book is one of the books that will be sent to you during the 0 to 8 week period. We call this our what to expecting when you are expecting a puppy series. We send out books, and weekly emails to prepare you and your family for the arrival of an Australian Labradoodle Puppy for 0 to 8 weeks. The following is a summary of the book and other information we have gained in preparing for an Australian Labradoodle when you have kids. The first month is very challenging. It all takes time. I do believe that of all the breeds in the world, the Australian Labradoodle has been designed specifically for the family, both retired empty nesters and those full of many kids. However, this does not mean training a puppy does not come with time and challenge. This means challenge to the adults and kids. You are kidding yourself if you think a kid can take on this challenge alone or that you will not be the primary care giver or leader and constant supervisor of the puppy during the first 2 months home. Please read the Training web page I have provided for more detailed training advice. Prepare a schedule, an example is on the Training web page. Look at your week and determine the exact times your puppy will get up, go out, eat, sleep, nap and play then POST the schedule. This time table is critical for the puppy and the child. You and your kids need to know for example that morning time is for going to the bathroom with an adult supervising, to eat, then going again to the bathroom with an adult and then about 30 min. of solid adult supervised kid play before a puppy nap. This allows the kids and you to know when to play and when to leave the dog alone. Play time is about just that, play. The books will give you some examples of games for kids to play with the puppy. Set a training schedule. In that daily schedule set aside time for training the puppy…and the kids. This involves joining a class, and I suggest finding a trainer to come to your home and provide hands on training. Specifically look for a trainer that works on behavioral issues, not just how to sit, stay and roll over. Learning how to work with your puppy and kids on behavior training will apply to all aspects of training a puppy. The outside class provides required socialization, the home trainer gives you specific advice for you and your kids. lots of love/cuddle the puppy time. The book Happy Kids, Happy Dogs, Building a Friendship Right From the Start, Barbara Shumannfang, has an entire chapter on playtime activities for kids and puppies/dogs. Also Puppy Training for Kids by Sarah Whitehead is a book offering training play for kids 4 to twelve. These books offer planned supervised activities each day to empower your children to train your puppy/dog and build a relationship of love and friendship. Children should not be allowed to carry the puppy at first, wait to use this as a reward for following all the rules for the first few days, and then allow this with supervision. No screaming, running or chasing. Puppy play time is quiet and in slow motion. When everything gets out of control, the next word is "freeze". Puppies will chase a kid that runs, because they think they are following a leader, the leader moves faster, the puppy moves faster. The leader stops, the puppy stops. The leader is calm, yes, the puppy is calm. The puppy needs private space away from kids. The area they eat and sleep in is private space and only for the puppy unless the adult is with them. Never open the outside door and let the puppy outside, unless it is into a fenced area. And the leader should always go out a door first. Leaders lead, in a puppies mind, so having the puppy go out first sets up a puppy as the leader. This is not the hierarchy you want to foster. Puppy proof the house, and maintain this level of cleaning. You don’t want your puppy to eat your shoes, and we certainly don’t want the puppy to get sick from eating your shoe. Let the kids know that things on the floor will be picked up by the puppy until after a few months when the puppy learns its boundaries. Have appropriate dog toys and let the kids know if a puppy takes a non-toy then they need to get the right toy and trade the dog for it. Chasing the puppy for an item results in a game that they will rarely win whereas training the puppy to trade is the correct response. Kids and adults should ALWAYS be able to take a toy away from a puppy. The issue is to make sure the puppy gets it back after a short period. Games of fetch are great to encourage the taking of a toy and throwing it back. Australian Labradoodles are inside dogs, never leave them outside except to go to the bathroom, they will never want to just sit outside. Never tie them up outside, they will get into trouble, not to mention this is not what getting a dog is all about. The rule is, when the puppy is outside to play so are you. Plan what the role of the kids is during outside potty time. I had mine sit by the window and watch, this way I could see them and they could watch the puppy. Puppies seldom want to go to the bathroom while a toddler is running about. Socialization is very important. If puppy time becomes chaos and therefore you decide to keep the puppy in his crate, room or outside, nothing will get better, if anything it will get worse as the puppy will lack the social skills necessary to be with kids and even adults, he will distrust or even exhibit fear of any social contact. He will crave love and attention. Know up front that this is time well spent and plan for it now. This means just as I have stated, plan for play time, love time, and visit times, just supervise them and keep things in control. I suggest holding the puppy in your arms when meeting more than one other adult person until the puppy has had about 50 great experience meeting people. We do what we can here to socialize your puppy, however once they are not in the security of us and our home environment the puppy needs to know that all meet and greets are wonderful. By holding the puppy up near the faces of those coming towards them you add a sense of security and reduce the overwhelming nature of two or more kids and adults standing over the puppy all trying to pet him at the same time. If this was you, and 3 giants came in to a home you barely know and all try and touch you….you would run. Once the 50 great experiences have occurred your puppy will be ready to meet people on all levels. Socialization referrers to meeting other people of all ages and race, meeting other dogs, cats, and so on, so complete the training by covering these areas. You should not take the puppy to places where sick dogs may be, for example, dog parks or pet stores, but yes take them to a friend’s house or have a friend’s dog visit. Learn about puppy behavior and how to properly train a puppy. This includes mouthing, jumping up, lack of interest or listening to children, hiding, toy guarding, ignoring cues, growling, fear, and the chase game. Having the kids offer treats, understanding body language, knowing how kids should play with the puppy is important, so read the books recommended above and others. You, your family and the puppy will appreciate it. Chapter 9 in the book goes into specific detail on, How Do children Interact with Puppies, and How Should They? This section offers invaluable lessons for you and the kids. The age of the child does not determine if they are ready for a dog or not, the child's ability to understand the above rules and listen should be the determining factor. The great thing about Australian Labradoodles is that, if breed properly; they will adjust to your schedule. They can handle a daily run or just playing around the house. They can be couch potatoes or athletes. This is up to you and your family. This does not mean that they can handle sitting in a room all day, but they are very adaptive to the typical family that does not always follow a daily walking routine. Make sure your breeder is well aware of what you expect from the dog and that the dog is selected to meet these criteria. And for heaven sake, it is a dog, not a stuffed animal, they will get into trouble, do the wrong thing now and again, it takes time just like all good things. Training a puppy is not much different than training your kids, but at the end of the day they will not throw a temper tantrum. And just like family, they will love you unconditionally. This is the reward all kids should learn as the result of taking on the responsibility to care for an animal. 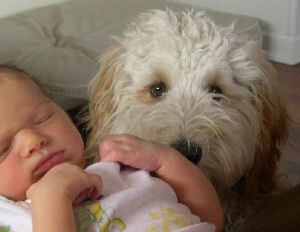 Labradoodles and kids can be great friends and companions. My dogs sleep at night with my kids, even my 4 year old son. My kids can hand feed my dogs and take a prized toy directly from their mouth. The dogs listen to my kids and when having trouble we work together to determine how to adjust the situation.